Interchangeable dog tog - Easy to remove! Have you bought a dog tag, squeezed it on to your dog's collar, then you can never get it off again? Or it's at least a huge pain(ful) effort! So what do you do when your pup gets a new collar? A new tag for every collar? Well..
Now you can get a dog tag that easily clamps on to your dog's collar, and when you swap collars - swap the tag over too! We have two versions, a slide on tag (quieter!) and the hanging style. This listing is for the HANGING style. We use a wide mouth swivel clasp that easily clamps over your collar's D ring. 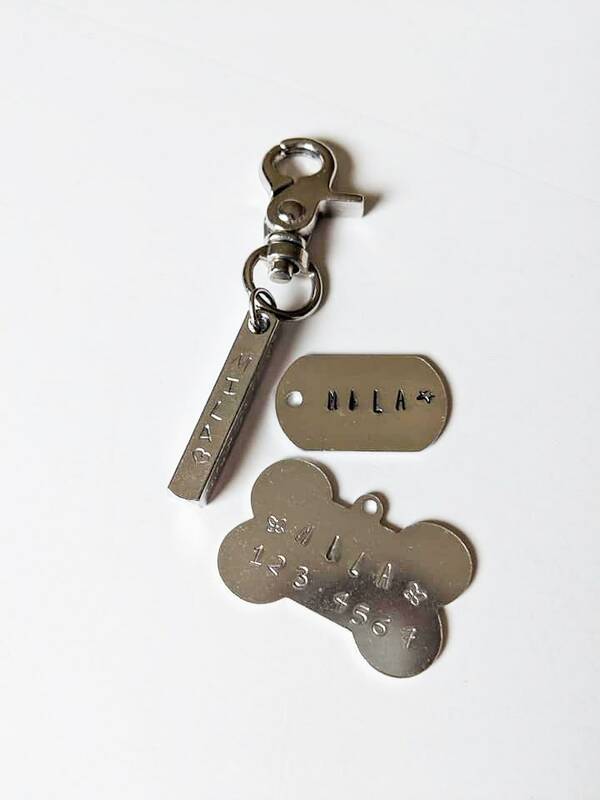 You may choose from a bone shape, 1.5 inch modern style bar, or military style 'dog tag' shape. If you would like the text darkened, please state so in the comments otherwise it will be left as a clean impression. So many fun options! Enter your pup's name and phone number (if you like). A max of 8 characters can comfortably fit on a row. 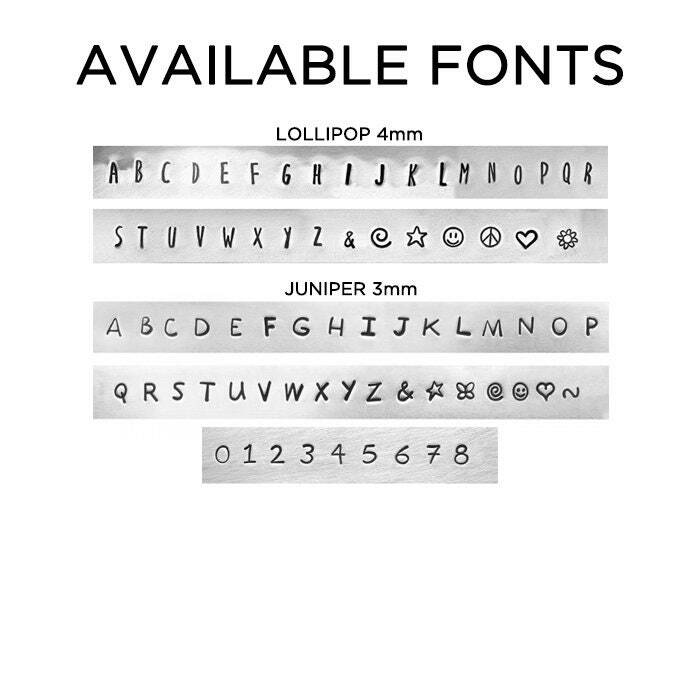 If you would like a different font for the name vs number - you can state this in the comments. 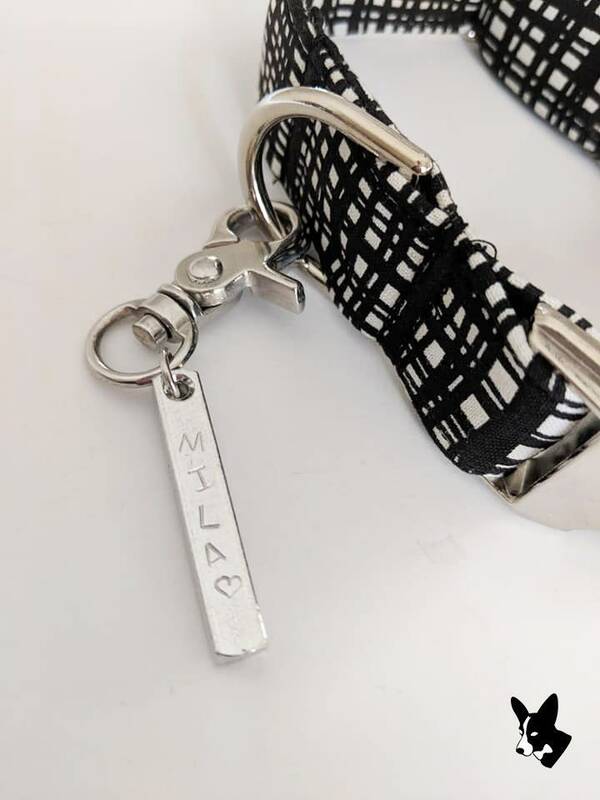 If you would like one of the stamped shapes as seen on the font photo, example: MILA (heart shape). If there is room on the line of text it can be added next to the name. The bone shape tag has more room to add fun stamped shapes around the name if you like.